Walking through the Aztec hall of the Museo Nacional de Antropología in Mexico City, the visitor notices that so many of the sculptures depict the gods of war and evoke the terrifying vision of human sacrifice. Indeed, these deities are the mythic images that represent the values of a society devoted to conquest. But one form stands out (sits, actually) in a completely alternative posture. The 1.2 metre-high statue depicts a male figure seated cross-legged on a temple platform (or perhaps a drum) decorated with butterflies and flowers. His head is tilted up, his eyes open, his mouth half open, his arms opened to the heavens and his hands above his knees with their respective index fingers and thumbs in contact. His sight seems to be towards the infinite. He wears great earrings and an armored chest with tassels that end as tiger paws or serpent’s fangs. Upon the center of his armor are two suns with a half moon upon each of them. He has bracelets and kneecaps that are finished as six-petaled flowers and leg-armor with paws that seize his ankles. Upon this leg-armor are two bellflowers whose corollas spread downward, one with six seeds and the other with five. His sandal lashes are graciously knotted upon his feet. In Aztec mythology Xochipilli (Show-shoo-pilli) was the god of love. As such, he was the god of summer, of flowers, games, dancing, singing, painting, writing and feasting. He was associated with fertility, agricultural produce and all those who valued pleasure and voluptuousness, including homosexuals. And he was the god of recently departed souls, who were often depicted as butterflies. His name, composed of the words xochitl (“flower”) and pilli (either “prince” or “child”), means “flower prince.” He had two brothers, Ixtlilton (the god of health) and Macuilxóchitl (the god of games). His wife was the human girl Mayahuel, and his twin sister was Xochiquetzal (“Flower Bird”). He was a god of excess. During his festivals, which were held in the early growing season, the people drank copious amounts of the alcoholic beverage pulque and decked out his statues with flowers and butterflies. Is this an ecstatic human in touch with the divine, or a god celebrating himself? Take a closer look at the photograph. Both the statue and the base upon which he sits are covered in carvings of sacred and psychoactive organisms! They include mushrooms (Psilocybe aztecorum), tobacco (Nicotiana tabacum), Ololiúqui (Turbina corymbosa), sinicuichi (Heimia salicifolia), possibly cacahuaxochitl (Quararibea funebris), and one unidentified flower. R. Gordon Wasson, in Persephone’s Quest: Entheogens and the Origins of Religion, argued that initiates of the Greek Eleusinian Mysteries utilized psychotropic plants to access altered states of consciousness. 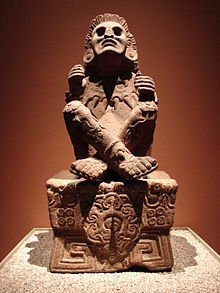 Regarding Xochipilli, Wasson suggested that the statue represents a figure in the throes of entheogenic (“generating the divine within”) ecstasy. The position and expression of the body, in combination with the very clear representations of hallucinogenic plants which are known to have been used in sacred contexts by the Aztec support this interpretation. …is absorbed in temicxoch, ‘the flowery dream’, as the Nahua say in describing the awesome experience that follows the ingestion of Sinicuichi (Heimia salicifolia). 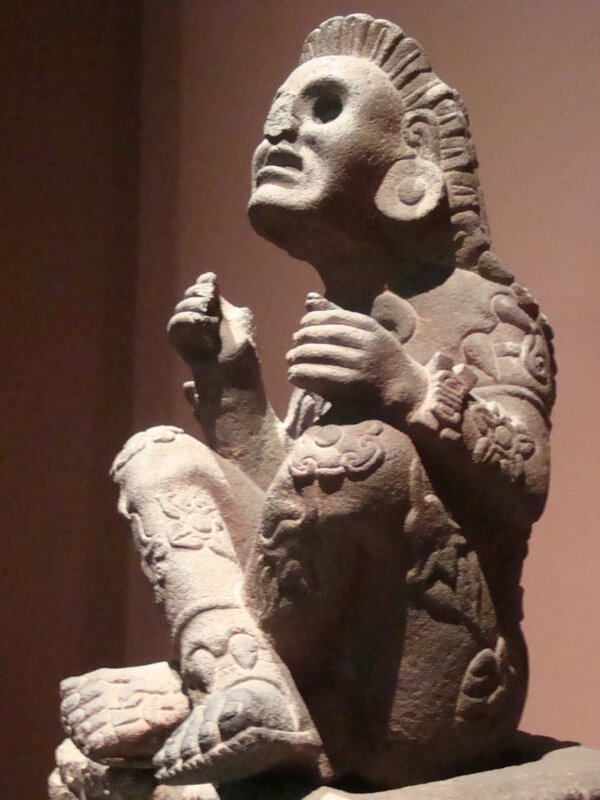 I can think of nothing like it in the long and rich history of European art: Xochipilli absorbed in temicxoch. Perhaps there are no other artworks comparable to this one. But Wasson knew that there was a Greek mythological figure who was a cousin to Xochipilli: Dionysus. Xochipilli and Dionysus share much in common. Both presided over the arts. Both were associated with states of excess, ecstasy and abandon. Both lived at, mediated or destroyed boundaries of every kind – physical, mental, sexual – yet both were married to human women. 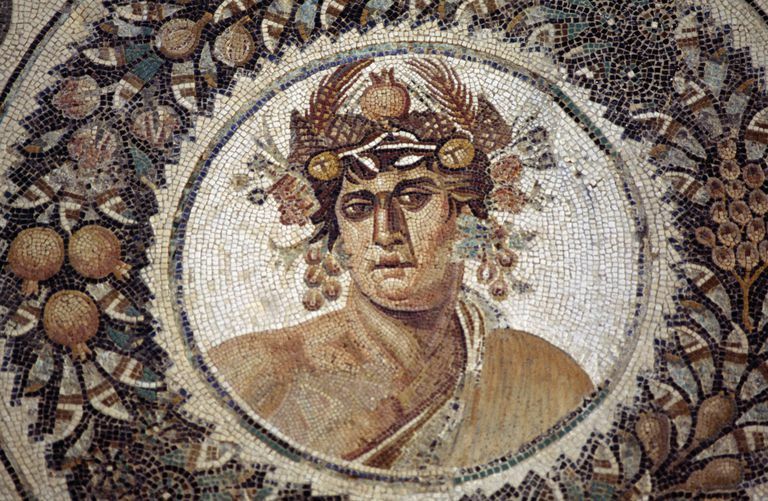 And Athens’ three-day celebration of Dionysus was called the Anthesteria, or “Festival of the Flowers,” to which, like Xochipilli, Dionysus brought the souls of the dead. Be good to us, you girl-crazy goat! We the poets begin and end our singing with you. And it’s impossible without you. Without you, we cannot remember our sacred songs! As with all archetypal figures, however, Xochipilli had another aspect. A sixteenth-century Spanish friar recounted that the god could strike down with terrible diseases those who did not observe the sacred fast days. And many stories of Dionysus told how he possessed humans who refused to accept his religion and drove them insane. He offered a choice: share in his ecstatic madness, or go crazy with repression. The psyche has infinite depth, and it can be transformed. Psyche, or soul, was also the Greek word for butterfly, the beautiful creature that grew miraculously from a caterpillar. If psyches can transform, then so can nations. Some scientists, by the way, have fallen under the sway of these two gods, coining the remarkably poetic term imaginal cell. There is no structural similarity at all between a caterpillar and a butterfly. After the caterpillar forms its chrysalis it literally dissolves into soup. The imaginal cells, which contain the blueprint of the new creature, wake from their dormancy and begin the process of transformation. Do you know how the caterpillar turns? Do you remember what happens inside a cocoon? the sheer inevitability of wings. This scientific mystery mirrors deeper mysteries of both soul and culture. Both civilizations – the Aztecs and the Classical Athenians – were misogynistic empires that brutally subjugated their neighbors and emphasized the values of extreme masculinity and military prowess. Not unlike our own. But the wisest individuals in both Greece and the Valley of Mexico knew that such values had to be balanced by their opposites, and over great periods of time they evolved myths and communal rituals that expressed these mysteries. Apollo, described as the “most Greek” of all the gods, would leave his sanctuary of Delphi for three months of the year, during which time Dionysus moved in. This culture of extreme rationality understood the importance of honoring the irrational. Similarly, the Aztecs periodically relaxed the eternal vigilance of their fascist state to celebrate the gentle God of Flowers, who offered them an alternative vision of the potential of the masculine, a vision of non-aggressive creativity. Here is a profound lesson for us.